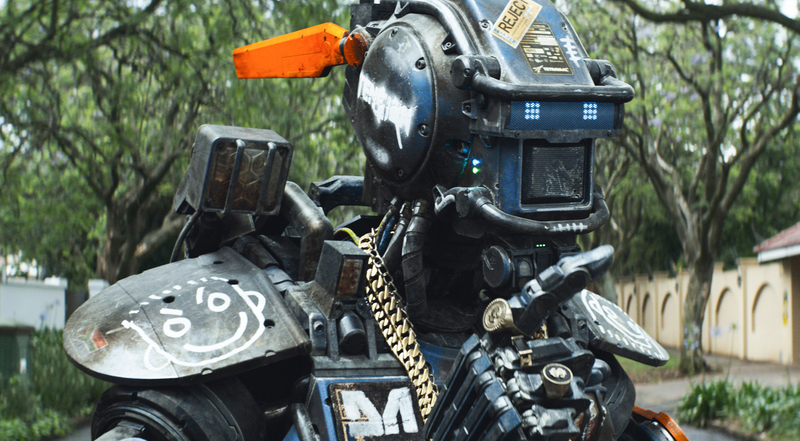 Following Niell Blomkamp’s District 9 and Elysium is his latest technological treatise, CHAPPiE. Starring Dev Patel as Frankenstein to Sharlto Copley’s robotic monster, this exploration of nature versus nurture fails to power up. Set in a recognisable urban world, Johannesburg now uses well-managed droids to police the streets. Droid designer Deon Wilson (Patel) is desperate to create a robot that can feel, while colleague Vincent (Hugh Jackman) envies Wilson’s success and is constantly shut down on his own robotic project, codename ‘Moose’. Blomkamp has always struggled to balance pertinent issues with a concise plot. District 9 managed to effectively touch upon themes of immigration but his follow-up Elysium, framed around severe inequality, had a story that didn’t effectively resolve the wider issues. CHAPPiE, unfortunately, falls in the latter camp. While it ambitiously sets up issues regarding a bias media, an overdependence on automation and weaponised use of technology, it then veers off towards a lawless undertone as a group of steam-punk criminals raise ‘Chappie’ themselves, to the horror of Deon. This additional layer of growth and influence muddies the water. Tragically, this over-complicated plot means that casting an iconic sci-fi actor in Sigourney Weaver is utterly wasted. CHAPPiE, like all of Blomkamp’s cinematic environments, looks outstanding. Detailed, dated technology adds character and depth to mechanical forms. ‘Chappie’ himself, touchingly, has a ‘reject’ sticker stuck over his heart while unique lingo (E.g. “dipstick” and “dunny rat”) make the world vivid and well-crafted. Blomkamp will strike gold soon, but CHAPPiE isn’t it.